So we got back to our normal routines after Easter break and everything is working well! I'm being trained to start leading the kitchen next month and the work in the Mercy House is doing well also. Praise the Lord! He is always so good and faithful! We have been receiving more people in the Mercy House recently so we are very happy! Also, after Easter, we started opening everyday from 10 to 14! I still work there only on Mondays and Fridays but it is so good to see the project growing! I haven't managed to gather students for the English classes yet, though. Please pray that people will come and that we'll find a time for the classes that will work well for many refugees. Last Friday I had a good chat with this gypsy lady from Romania who is in the picture. 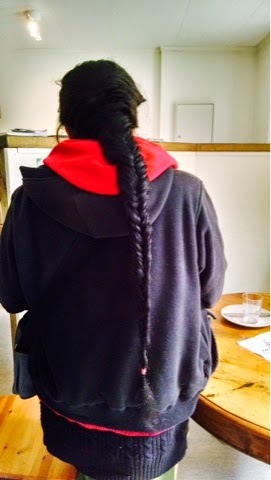 I ended up braiding her long long hair! Also today she was sitting at the door of the church when we came, so I invited her in and she came and took part in the service with us! But I really feel for her because she is pregnant and trapped in a life of begging for money, sitting outside on the cold streets of Hamar. Please pray for her. Thanks you for being part of this! Voltamos à nossa rotina normal depois do feriado de Páscoa e tudo tem funcionado bem! Estou sendo treinada pra assumir a liderança da cozinha no mês que vem e trabalho na Mercy House continua indo bem também. Glória a Deus! Ele é sempre tão bom e fiel! Começamos a receber mais pessoas na Mercy House recentemente, então nós estamos muito felizes! Depois da Páscoa, nós começamos a abrir todos os dias de 10 às 14! Eu ajnda trabalho lá só nas segundas e sextas, mas é muito ver o projeto crescendo! Ainda não consegui juntar alunos pras aulas de inglês. Por favor, ore pra que as pessoas possam vir e pra a gente consiga oraganizar um horário que atenda bem a muitos refugiados. Sexta passada tive uma boa conversa com essa mulher cigana da Romênia que está na foto. Acabei fazendo uma trança no cabelão dela! Hoje ela estava sentada na porta da igreja quando eu cheguei, então eu a convidei a entrar comigo e ela foi e participou do culto com a gente! Mas eu fiquei muito tocada com a situação dela porque ela está grávida e presa numa vida de pedir dinheiro sentada do lado de fora nas ruas frias de Hamar. Por favor, ore por ela. Obrigada por fazer parte disso comigo! Happy Easter! / Feliz Páscoa!